ASAP Systems, the market leader in the Inventory System and Asset Tracking, announces how its Cloud-Based Inventory and Asset Tracking Software has a new “Layout” feature. 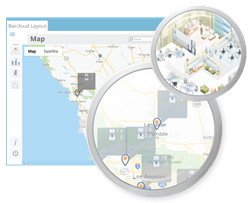 The Layout feature allows both Inventory and Asset Tracking System users the ability to physically locate an available asset and inventory items whether in the office or warehouse/stockroom. The feature will grant users a smarter allocation of resources, inventory and asset control, more efficient use of time and most importantly, absolute physical visibility over the available asset and inventory items. The administrator has the power to build the map or plan for their inventory and assets. The Administrator can add the addresses to be shown on the map, allocate buildings to the addresses and floor plans/layouts within those buildings. The layouts can be broken down into multiple locations. The Layout feature allows users to run a global search through the map and visualize the available asset quantity and stock quantity at every address. This feature also offers the ability to filter the view by either site, building or layout view.